Automatically restart Mongoose when it crashes or stops for any reason. Ensure that your files are available from your web browser at all times! Install and configure Mongoose, if necessary. 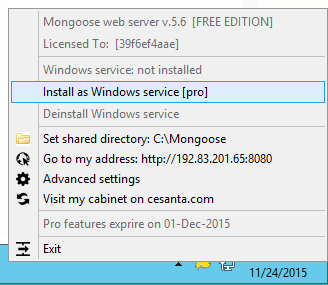 We already have Mongoose Free Edition installed as a windows service on our Windows Server 2012 R2 PC. 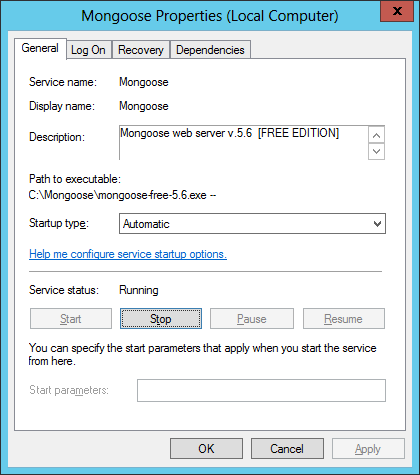 On the General tab, in the Service to protect field, select the Mongoose windows service. You will notice a green circle on the left if the service is already running, as pictured below. Click over to the Monitor tab, where we will set up a failure detection script to tell Service Protector when Mongoose has failed and is not serving pages. Follow these instructions to create the failure detection BAT file. 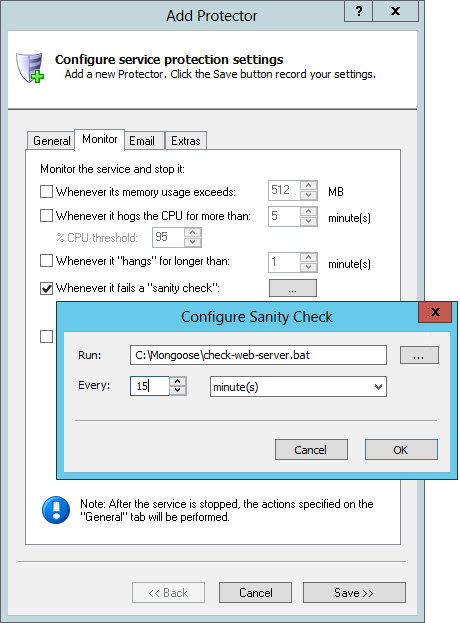 We have called ours check-web-server.bat and placed it in our Mongoose folder (C:\Mongoose). 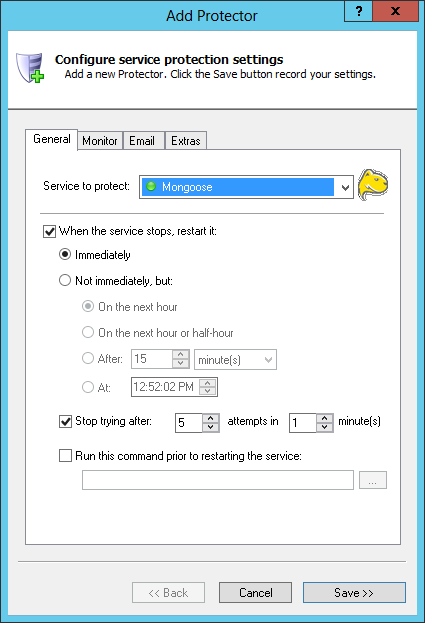 We're done configuring Mongoose with Service Protector so click the Save >> button to record your settings. 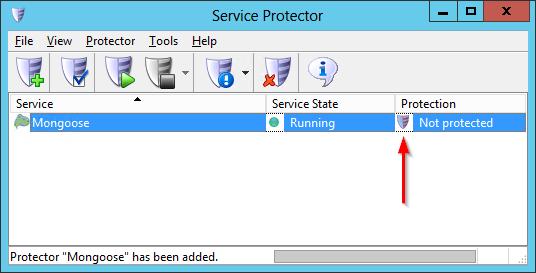 In a second or two, an entry for Mongoose will show up in the Service Protector window. Here the Mongoose service is already running but it's not yet being monitored by Service Protector (hence the red shield). That's it! Next time your computer boots, Mongoose will start (as normal) and Service Protector will begin watching the service to promptly restart it if it stops for any reason. 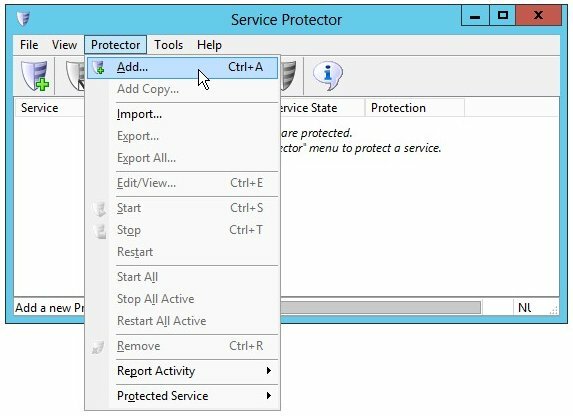 We encourage you to edit the Mongoose entry in Service Protector and check out the many other settings that may be appropriate for your environment. For example, send email alerts when the service fails, restart the service if it gets stuck starting or stopping, and much more. Trouble protecting the Mongoose Windows Service?